David Narbaitz opened Monopolatte, Ottawa’s first board game café. As part of the management team at the fledgling café, I was tasked with fulfilling the technological needs of Monopolatte on a constrained budget. When it comes to commercial restaurant point of sale (rPOS) systems the hardware isn’t the most expensive part, software licenses are. Sit down restaurants like Monopolatte benefit from the features of an electronic point of sale system. While I will acknowledge that there was a time when restaurants worked very effectively using paper-based tab tracking/ordering systems, they aren’t perfect. Modern electronic systems allow servers to effortlessly split bills and provide robust auditing systems ensuring adequate checks and balances on the handling of money. I did some research on what was available in the realm of open source rPOS systems. I was able to find the source code for one: FloreantPOS. Floreant seemed to fit the bill for what we needed: an open source rPOS system with a touchscreen interface and chit printing. 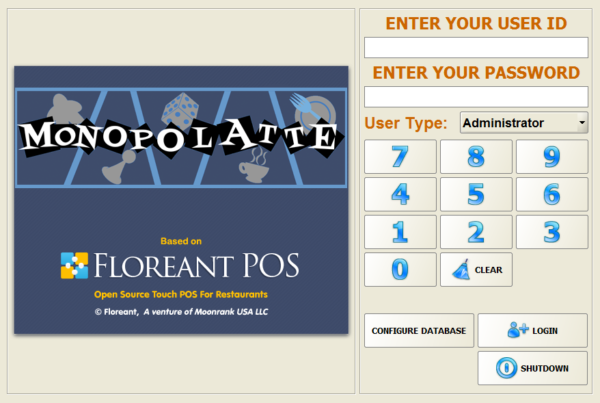 Floreant was Java-based and supported multiple terminals. After some preliminary testing on existing machines Monopolatte invested $200 in a touch screen terminal and two thermal printers which was enough to get us up and running in the pre-opening environment. While the system properly accepted orders, printed chits, printed receipts, and calculated change we noticed that refill orders broke the chit printing option, the cash drawer reconciliation system was very broken, and there was no effective way to extract exact financial information. The re-order chit printing issue was easily fixed as it was a known issue with fixes available online. Fixing the settlement and sales reporting issues were completed with some changes in the system’s source and a new report. In doing this work I uncovered other shortfalls with the system such as the extensive use of the floating point data type, non-transactional database calls, and improper rounding. Being an open source system I was able to resolve some of the issues which crept up giving us a system which served Monopolatte well for the life of the café. While the system worked well, there were some faults that couldn’t be resolved without major rework. Rather than rewriting vast parts of Floreant I developed a plan to build a replacement open source rPOS system though David closed Monopolatte before it was implemented. Note: Floreant is being developed again and has had some new features added. I’m not sure if the issues we encountered in 2012 have been corrected but it may be worth checking out the latest updates to see if all the issues we had to tackle back in the day have been resolved in the new edition. One of the features FloreantPOS lacked was the ability to properly reconcile receipts, cash, and debit batches. Not many POS systems do and many companies turn to Excel spreadsheets in order to ensure everything balances. It was easy to create a spreadsheet to facilitate this process but I also needed to create a report to extract the proper information from the Floreant database. The report was slightly complex as certain database records would get duplicated when settling tabs but with a bit of work I was able to get a sane view of the data. With the numbers from the daily Floreant report, the debit machine batch close, and cash drawer counts are entered into the spreadsheet Monopolatte’s managers could easily see if everything was balanced or not. As anyone who operates a restaurant knows, having the till balance at the end of the day is a happy occurrence but not always a regular one. Between drawer bleeds to purchase last minute supplies, commission payments, and other exceptions, making the day’s numbers balance can sometimes be quite the task. Once a day’s transactions are balanced, the spreadsheet would provide the data to be entered into the accounting system which would allow for easy bookkeeping – though my goal for the next project of its kind is to have an automatic import into Quickbooks to save that bit of effort. Another advantage to the report I wrote was that I made sure that we were able to track sales by profit centre. While not something a lot of small restaurants do, it didn’t require much more work but allowed us to see where our revenues were coming from and react quickly to changes. Monopolatte wasn’t a static entity. Periodic changes to the rPOS, activities, and renovations may have been visible to the regular customers but there were a few projects which were embarked upon but didn’t make it into the public eye before David decided to close down Monopolatte. One of these projects was expanding the Monopolatte’s offering to include classic console video games. In considering this option we realized that simply obtaining some games, consoles, and TVs wasn’t going to work as the standard tables for playing board games aren’t a good layout for playing console games. You don’t want people around a central table you, preferably, want people in a row or semi-circle facing the television; for board games you want lots of light while for e-sports you want less light. 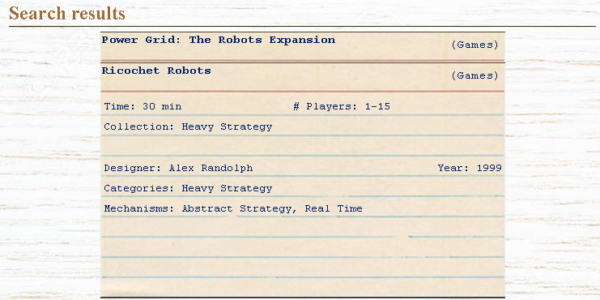 Having a booth with a wide-viewing-angle TV embedded several inches beyond the back of the booth with locally-controlled highly-focused lighting seemed like a potential hybrid which would work for both board games and video games… but would it? We elected to find out so built a prototype. After a few rounds of testing we had come up with a list of issues. We then disassembled the prototype, updated the design and assembled the second prototype. The second prototype worked really well and we felt like we had a good solution to the problem of how to offer both conventional and video games to our clients. Another project involved rebranding Monopolatte as a 1950’s hotel. For this project, I was in charge of hotel’s web presence. The website was a pleasure to design and create as the specification was to have a website which felt retro and gave a nod to what a high-scale board games café would have been like sixty years ago. For example the site featured a board game listing and search page but was organized much in the same way a library card file would have been. The site featured some hidden information which may only be revealed if you looked closely at the source code, searched for specific information, or printed certain pages. The hidden information was needed as part of an Alternate Reality Game (ARG) which was designed alongside the rebranding. Due to staff turnover some of the people responsible for spearheading the ARG left Monopolatte before it was launched. Not wanting to waste the new assets, there were plans to port parts of the web properties to the main Monopolatte website after I completed the Sheila Project but the café closed down before I was able to complete the re-skinning and port. David elected to close down the café and wrap up operations after over four years in operation due to personal reasons and a desire to pursue other opportunities. It was sad to see the project come to a close as it let me get creative in ways that I, generally, don’t have the opportunity to in other parts of my life. I wish to thank David for giving me the opportunity to contribute to his endeavour and all the staff at Monopolatte who made being involved very enjoyable over the years. A great deal of thanks is also due to all of the clients who enjoyed the café, making our work worthwhile.